The EOS 600D uses the same 18-megapixel sensor already seen in the EOS 550D. This sensor has a higher definition than that of its competitors, and largely dominates the D5000 (only 12 megapixels). Back in the days when the D5000 was launched, this was a good standard. But more pixels does not mean better metrics, and indeed, the DxOMark Scores for the EOS 600D place it behind both the D5000 and Alpha 55, handicapped by a lower Landscape and low light performance scores. The D5000 and the Alpha 55 have comparable DXOMark Scores. The Canon is deeply penalized by persistent noise noticeable in the dark areas at low ISO settings. The dynamic range graph and the EOS 600D curve directly points to this phenomenon. From ISO 100 to ISO 400, the EOS 600D’s curve is horizontal, with both the D5000 and the Alpha 55 scoring 1EV above it. Once again, as noticed with the EOS 1100D, analyzing the full SNR graph for the D600 confirms the problem. The curves representing ISO 100 and ISO 200 overlap on their left sides (the dark zones, with the curve for ISO 400 very close as well, which should not be the case. Let’s look at the SNR 18% metrics, which simply confirm all of this: the D5000 produces less noise than the EOS 600D, no matter the ISO speed. The difference is as high as 3 dB between ISO 100 and ISO 400, and slowly decreases afterwards. The same kind of performance can be noticed for color sensitivity. The EOS 600D is outperformed by the D5000, and here again the difference can be quite significant, reaching almost 3 bits at ISO 400. Compared to EOS 550D: Improvement? 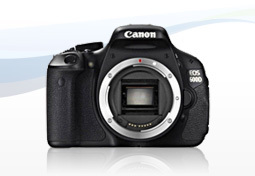 Is the EOS 600D able to produce a different image than the EOS 550D? Given the use of the same sensor and the same image processing engine, the answer should logically be… no. Our measurements simply confirm this, allowing for a very quick comparison. The DxOMark scores are almost identical. Any differences here and there are too tiny to be relevant. Similar DxOMark Scores, and also similar metrics. The SNR 18% graph below shows a perfect match. All the other metrics are like this one: absolute similitude. So what was clear on the spec sheet is confirmed by the metrics. EOS 550D and 600D are almost the same cameras as far as sensor performance is concerned. The only differences pertain to the new functions implemented in the EOS 600D, such as the articulated LCD monitor borrowed from the EOS 60D, the creative filters, and the Video Snapshot function. The new EOS 600D brings no improvement over the 550D other than a few features. The two sensors perform exactly the same, and show the same persistent noise problem in dark areas at low ISO speeds, preventing it from achieving good dynamic range metrics. By contrast, Sony’s new sensors have efficiently solved this issue. Competition may be tough between Sony and Nikon, but Canon continues to lag behind them both.